This high performance shaft kit utilizes two smooth, needle bearing universal joints, a prefabricated shaft to bolt directly into the column and weldless intermediate shaft for easy installation. This long-wearing design eliminates the rag joint for better steering response, streamlined appearance and improved header clearance. The overall length is 13 inches. An absolute must when using large tube headers. An absolute must when using large tube headers. 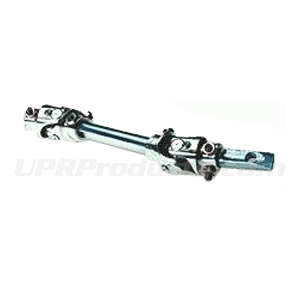 Additional DD shaft can be ordered for applications requiring longer length. This can be used with our manual rack to eliminate the rag joint and improve steering response! No one else gives you the bold clean styling of our Aftermarket Dress Ups, Suspension and Performance Parts for your American Muscle Car like UPR Products! Fits these Vehicles: 1994 1995 1996 1997 1998 1999 2000 2001 2002 2003 2004 GT V8 Mustang Roush & Saleen Vehicles.